From here on Earth, the Sun like a smooth ball of light. And prior to Galileo’s discovery of sunposts, astronomers even thought it was a perfect orb with no imperfections. However, thanks to improved instruments and many centuries of study, we know that the Sun is much like the planets of our Solar System. In addition to imperfections on its surface, the Sun is also made up of several layers, each of which serves its own purpose. It’s this structure of the Sun that powers this massive engine that provides the planets with all the light and heat they receive. And here on Earth, it is what provides all life forms with the energy they need to thrive and survive. If you could take the Sun apart, and stack up its various elements, you would find that the Sun is made of hydrogen (74%) and helium (about 24%). Astronomers consider anything heavier than helium to be a metal. The remaining amount of the Sun is made of iron, nickel, oxygen, silicon, sulfur, magnesium, carbon, neon, calcium and chromium. In fact, the Sun is 1% oxygen; and everything else comes out of that last 1%. Where did these elements come from? The hydrogen and helium came from the Big Bang. In the early moments of the Universe, the first element, hydrogen, formed from the soup of elementary particles. The pressure and temperatures were still so intense that the entire Universe had the same conditions as the core of a star. Hydrogen was fused into helium until the Universe cooled down enough that this reaction couldn’t happen any more. The ratios of hydrogen and helium that we see in the Universe today were created in those first few moments after the Big Bang. The other elements were created in other stars. Stars are constantly fusing hydrogen into helium in their cores. Once the hydrogen in the core runs out, they switch to fusing heavier and heavier elements, like helium, lithium, oxygen. Most of the heavier metals we see in the Sun were formed in other stars at the end of their lives. The heaviest elements, like gold and uranium, were formed when stars many times more massive that our Sun detonated in supernova explosions. In a fraction of a second, as a black hole was forming, elements were crushed together in the intense heat and pressure to form the heaviest elements. The explosion scattered these elements across the region, where they could contribute to the formation of new stars. Our Sun is made up of elements left over from the Big Bang, elements formed from dying stars, and elements created in supernovae. That’s pretty amazing. Although the Sun is mostly just a ball of hydrogen and helium, it’s actually broken up into distinct layers. The layers of the Sun are created because the temperatures and pressures increase as you move towards the center of the Sun. The hydrogen and helium behave differently under the changing conditions. The Core: Let’s start at the innermost layer of the Sun, the core of the Sun. This is the very center of the Sun, where temperatures and pressures are so high that fusion can happen. The Sun is combining hydrogen into helium atoms, and this reaction gives off the light and heat that we see here on Earth. The density of the core is 150 times the density of water, and the temperatures are thought to be 13,600,000 degrees Kelvin. Astronomers believe that the core of the Sun extends from the center out to about 0.2 solar radius. And within this region, temperatures and pressures are so high that hydrogen atoms are torn apart to form separate protons, neutrons and electrons. With all of these free floating particles, the Sun is able to reform them into atoms of helium. This reaction is exothermic. That means that the reaction gives off a tremendous amount of heat – 3.89 x 1033 ergs of energy every second. The light pressure of all this energy streaming from the core of the Sun is what stops it from collapsing inward on itself. Radiative Zone: The radiative zone of the Sun starts at the edge of the core of the Sun (0.2 solar radii), and extends up to about 0.7 radii. Within the radiative zone, the solar material is hot and dense enough that thermal radiation transfers the heat of the core outward through the Sun. The core of the Sun is where nuclear fusion reactions are happening – protons are merged together to create atoms of helium. This reaction produces a tremendous amount of gamma radiation. These photons of energy are emitted, absorbed, and then emitted again by various particles in the radiative zone. The path that photons take is called the “random walk”. Instead of going in a straight beam of light, they travel in a zigzag direction, eventually reaching the surface of the Sun. In fact, it can take a single photon upwards of 200,000 years to make the journey through the radiative zone of the Sun. As they transfer from particle to particle, the photons lose energy. That’s a good thing, since we wouldn’t want only gamma radiation streaming from the Sun. Once these photons reach space, they take a mere 8 minutes to get to Earth. Most stars will have radiative zones, but their size depends on the star’s size. Small stars will have much smaller radiative zones, and the convective zone will take up a larger portion of the star’s interior. The smallest stars might not have a radiative zone at all, with the convective zone reaching all the way down to the core. The largest stars would have the opposite situation, where the radiative zone reaches all the way up to the surface. Convective Zone: Outside the radiative zone is another layer, called the convective zone, where heat from inside the Sun is carried up by columns of hot gas. Most stars have a convective zone. In the case of the Sun, it starts at around 70% of the Sun’s radius and goes to the outer surface (the photosphere). Gas deeper inside the star is heated up so that it rises, like globs of wax in a lava lamp. As it gets to the surface, the gas loses some of its heat, cools down, and sinks back towards the center to pick up more heat. Another example would be a pot of boiling water on the stove. The surface of the Sun looks granulated. These granules are the columns of hot gas that carry heat to the surface. They can be more than 1,000 km across, and typically last about 8 to 20 minutes before dissipating. Astronomers think that low mass stars, like red dwarfs, have a convective zone that goes all the way down to the core. Unlike the Sun, they don’t have a radiative zone at all. Photosphere: The layer of the Sun that we can see from Earth is called the photosphere. Below the photosphere, the Sun becomes opaque to visible light, and astronomers have to use other methods to probe its interior. The temperature of the photosphere is about 6,000 Kelvin, and gives off the yellow-white light that we see. Above the photosphere is the atmosphere of the Sun. Perhaps the most dramatic of these is the corona, which is visible during a total solar eclipse. Below is a diagram of the Sun, originally developed by NASA for educational purposes. Visible, IR and UV radiation – The light that we see coming from the Sun is visible, but if you close your eyes and just feel the warmth, that’s IR, or infrared radiation. And the light that gives you a sunburn is ultraviolet (UV) radiation. The Sun produces all of these wavelengths at the same time. Photosphere 6000 K – The photosphere is the surface of the Sun. This is the region where light from the interior finally reaches space. The temperature is 6000 K, which is the same as 5,700 degrees C.
Radio emissions – In addition to visible, IR and UV, the Sun also gives off radio emissions, which can be detected by a radio telescope. These emissions rise and fall depending on the number of sunspots on the surface of the Sun. Coronal Hole – These are regions on the Sun where the corona is cooler, darker and has less dense plasma. 2100000 – This is the temperature of the Sun’s radiative zone. Convective zone/Turbulent convection – This is the region of the Sun where heat from the core is transferred through convection. Warm columns of plasma rise to the surface in columns, release their heat and then fall back down to heat up again. Coronal loops – These are loops of plasma in the Sun’s atmosphere that follows magnetic flux lines. They look like big arches, stretching up from the surface of the Sun for hundreds of thousands of kilometers. 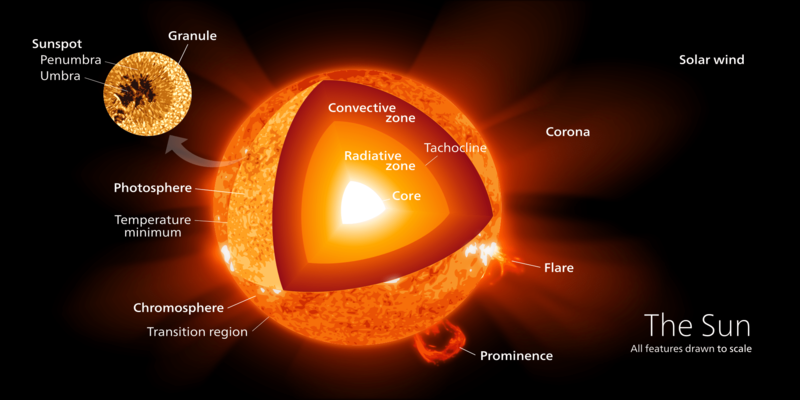 Core – The is the heart of the Sun, where the temperatures and pressures are so high that nuclear fusion reactions can happen. All of the energy coming from the Sun originates from the core. 14500000 K – The temperature of the core of the Sun. Radiative Zone – The region of the Sun where energy can only be transferred through radiation. It can take a single photon 200,000 years to get from the core, through the radiative zone, out to the surface and into space. Neutrinos – Neutrinos are nearly mass-less particles blasted out from the Sun as part of the fusion reactions. There are millions of neutrinos passing through your body every second, but they don’t interact, so you can’t feel them. Chromospheric Flare – The Sun’s magnetic field can get twisted up and then snap into a different configuration. When this happens, there can be powerful X-ray flares emanating from the surface of the Sun. Magnetic Field Loop – The Sun’s magnetic field extends out above its surface, and can be seen because hot plasma in the atmosphere follows the field lines. Spot – A sunspot. These are areas on the Sun’s surface where the magnetic field lines pierce the surface of the Sun, and they’re relatively cooler than the surrounding areas. Prominence – A bright feature that extends above the surface of the Sun, often in the shape of a loop. Energetic particles – There can be energetic particles blasting off the surface of the Sun to create the solar wind. In solar storms, energetic protons can be accelerated to nearly the speed of light. X-rays – In addition to the wavelengths we can see, there are invisible X-rays coming from the Sun, especially during flares. The Earth’s atmosphere protects us from this radiation. Bright spots and short-lived magnetic regions – The surface of the Sun has many brighter and dimmer spots caused by changing temperature. The temperature changes from the constantly shifting magnetic field. Yes, the Sun is like an onion. Peel back one layer and you’ll find many more. But in this case, each layers is responsible for a different function. And what they add to is a giant furnace and light source that keeps us living beings here on Earth warm and illuminated! We have written many interesting articles about the Sun here at Universe Today. Here’s Ten Interesting Facts About the Sun, What Color is the Sun?, What is the Life Cycle of the Sun?, What Kind of Star is the Sun?, How Far is the Earth from the Sun?, and Could We Terraform the Sun? For more information, check out NASA’s page on the Sun, and Sun Facts at Eight Planets. There is a reason life that Earth is the only place in the Solar System where life is known to be able to live and thrive. Granted, scientists believe that there may be microbial or even aquatic life forms living beneath the icy surfaces of Europa and Enceladus, or in the methane lakes on Titan. But for the time being, Earth remains the only place that we know of that has all the right conditions for life to exist. One of the reasons for this is because the Earth lies within our Sun’s Habitable Zone (aka. “Goldilocks Zone”). This means that it is in right spot (neither too close nor too far) to receive the Sun’s abundant energy, which includes the light and heat that is essential for chemical reactions. But how exactly does our Sun go about producing this energy? What steps are involved, and how does it get to us here on planet Earth?